Bonfire Brewing grew in volume by 10 percent, donated more than $55,000 to philanthropic efforts, and hosted its largest Bonfire Block Party yet, among many other company milestones in 2017. Gather ‘round for Bonfire Brewing’s 2017 Year in Review. Bonfire Brewing brewed 3853.6 BBL of beer in 2017, a 10 percent volume increase from the previous year. The production staff canned 550,000 cans and bottled 25,000 22-ounce bombers throughout the year. In 2017, Bonfire Brewing bottled a Black IPA with Breakside Brewing, and released draft-only collaboration batches with Casey Brewing & Blending and Mockery Brewing. In December, Bonfire released its last batch of Fixed Grip Saison in cans. This will be Bonfire’s last seasonal beer to hit a can for the foreseeable future. Cans are still available in liquor stores across Colorado while supplies last. Bonfire refreshed its can label artwork, and re-introduced new Demshitz Brown Ale and Kindler Pale Ale cans to the Colorado marketplace. New Firestarter IPA, Brush Creek Blonde Ale, and WtFO Double IPA cans will debut 2018. Bonfire Brewing hired Cheyenne Richardson full-time in its marketing department following an internship and part-time work, and Andie Wooster as its full-time Front Range sales representative. Throughout the year, Bonfire contributed more than $55,000 to philanthropic efforts. This includes $23,000 in cash sponsorships for local music, club hockey and rec sports, and $20,000 in product and swag donations. Bonfire recently signed on to 1% for Land and Rivers— one percent of all to-go beer and merchandise sales at the tap room will go directly to the Eagle Valley Land Trust and the Eagle Valley Watershed Council. In June, Bonfire Brewing hosted its largest Block Party yet. Seven thousand attendees drank 156 kegs of Bonfire beer. This event raised $4000 for Cycle Effect. Bonfire continued its partnership with Eagle’s Yoga Off Broadway on an array of unforgettable events, including the Yoga Pants Party during Eagle Yoga Fest in September. The 9th annual Man of the Cliff marked the annual burly lumberjack competitions, beards, and brews in September. This event raised $8000 for First Descendents. 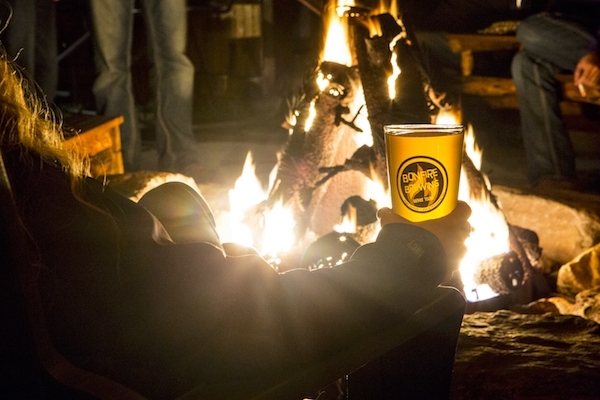 Craft enthusiasts and outdoor adventurers gather around Bonfire Brewing in Eagle, Colorado, where the beers are driven by quality, curiosity, and community. Launched in 2010, Bonfire is steered by husband- and-wife owners Andy and Amanda Jessen as they continue on their path of sustainable growth. Cans of Bonfire’s year-round beers are available in liquor stores and restaurants across Colorado. Gather ‘round Bonfire online at facebook.com/bonfirebrewing while the new bonfirebrewing.com is under construction.